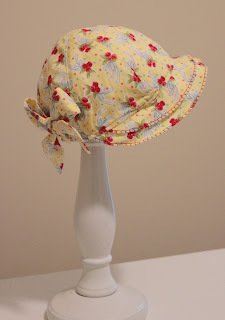 to wear and you will find so easy to make. Dad will not call it too sissy either! Want to purchase patterns on Etsy and save money? "LIKE" my Facebook for special deals, new patterns and updates. “Sew Vintage” Flouncy Sun Suit and Hat is just like the outfits that I made for my daughter 30 years ago. I remember making 5 in one day. One for each day of Vacation Bible School the following week. 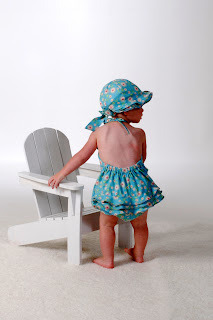 All color coded sizes from 3 months to 24 months are included for both the sun suit and hat. The neck of the sun suit has a elastic casing for a comfortable fit which ties into a bow in back. The legs have elastic casing and instructions are given for an optional snap crotch. The back also has an elastic waist with 3 rows of flouncy ruffles. "Sew Groovy" A Line Peasant Dress Pattern - NEW! “Sew Groovy” Peasant Dress is a softly gathered a line shaped dress with a flattering scoop neckline. Such a sweet and comfortable dress with elastic casing around the neck and sleeves. 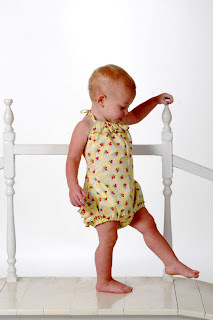 All color coded sizes from 6 months to 5 years are included in the same pattern. Some peasant dresses look more like a paper bag with armholes cut out. “Sew Groovy” has more shapely lines and curves like the dresses from my groovy days of the 60’s. To accomplish this pattern, I had to make the PDF pattern a full paper pattern that tapes together. Most peasant patterns are just straight pieces of fabric with armhole templates cut out. No shaping. If you do not want to tape together a full pattern then my “Sew Dainty “ blouse or under dress with just measurements and armhole templates is a good choice. Long and ¾ sleeve versions are included in the pattern. 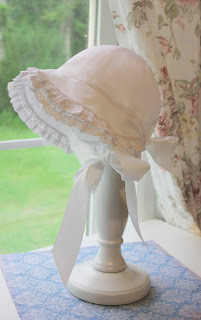 I have waited through several years of designing patterns to name and dedicate a pattern after my only daughter “Lacy”. This pattern depicts what a beautiful loving daughter that I have. She has helped me through every step of my pattern designing, web pages and photography. May I introduce you to “Sew Lacy” Double Pillowcase Dress. “Sew Lacy” is a classy double layered pillowcase dress or jumper with option for beautiful lace insertion. Sizes 6 months to 14 child are included in the PDF pattern. In some ways this double pillowcase dress is easier to make than a regular pillowcase dress. No fussy bias binding armhole facings to deal with and the hems can be sewn by machine and still look professional. There are many options to mix and match to make this basic dress your own unique creation. This versatile style can be worn alone or with a shirt underneath for cooler weather. New 30% off coupon code : "30percentoff". Use at web site when you purchase 3 or more patterns. Compares to the 3/$20 at Etsy. Never expires. www.footloosenfancyfree.com. Any pattern included in discount plus the new just released "Sew Lacy" double pillowcase dress pattern.